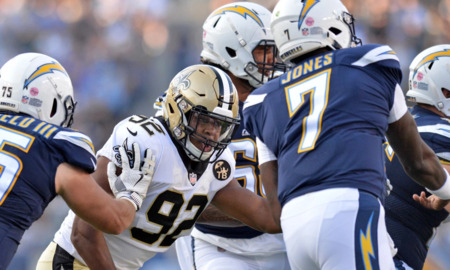 The success of New Orleans’ draft class was predicated on (and directly related to) that of (Marcus) Davenport, for whom the Saints surrendered two first-round picks, including their 30th overall selection in 2019. While the defensive lineman failed to crack the starting lineup, he racked up 4.5 sacks and 12.5 QB hits while playing 40 percent of the defensive snaps, and he made the PFWA All-Rookie Team. (Tre’Quan) Smith has the potential in Year 2 to assume full-time the No. 2 receiver role the Saints desperately need someone to seize for balance. Most of the rest of New Orleans’ draft spent time on other rosters in 2018, but the Saints found meaningful pickups in (Taylor) Stallworth, (Keith) Kirkwood and (Dan) Arnold, who all played roles as substitutes down the stretch. ..
Jeff Ireland needs to earn my trust again after this whiff compared to the previous draft that we killed! It's going to be hard to do with limited draft capital but it can be done.....I believe! Cmon Rugs the draft is a crap shoot anyway... re visit Jeff Ireland's list of players he's selected just over the last 2 seasons. He's earned my trust as a scout/evaluator of talent regardless of how poorly the last draft turned out. Most of the aforementioned guys are already good to ELITE players at their respective positions. Edit: Didn't he join us three years ago at the Senior bowl? If I recall his first draft was OK because he didn't have the full time with our scouting department to get a good feel for all the players. The he nailed it after a full year with the Saints. (I might remember this wrong though) I do credit him with cleaning out the scouting department and getting solid evaluators in here. Maybe the vision wasn't clear enough for him from the front office on what to bring in last year.